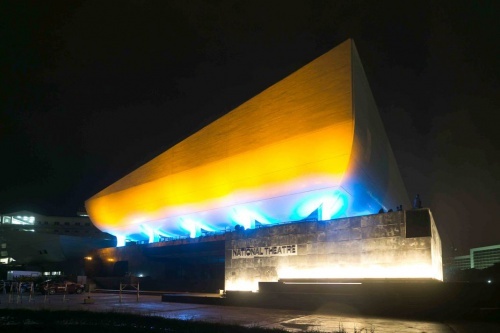 On 23 July, Phillips announced its “stunning makeover” of the National Theatre of Ghana.”using its latest connected LED technology to boost the beautification of the city of Accra, while also cutting energy consumption by up to 80%, as compared to the existing conventional lighting”. 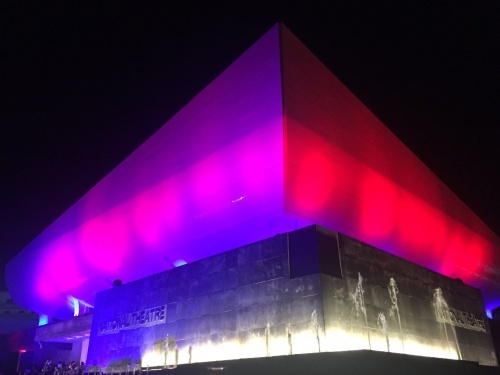 According to a press statement, “The new lighting system is installed throughout the entire façade of the National Theatre, enhancing its distinctive architectural structure and contributing to the building’s energy saving performance”. “Philips’ lighting concept is focused on highlighting the significance of this iconic building as an architectural masterpiece and as a source of national pride to Ghana, and in so doing assist with the building’s energy saving performance. “The new connected lighting system covers the 78m base platform of the National Theatre and illuminates the entire area of the central ship, as well as the columns supporting the ship. With a lifespan of up to 50,000 hours, the new Philips lighting fixtures last much longer and reduce the need for periodic replacement. Each installed luminaire has its own IP address; making it feasible to produce up to 16 million different lighting colors as well as remotely monitoring the performance of each light point”. Reacting to the development, Felix Darko, General Manager Lighting, Philips West Africa said, “The magnificent lighting at the National Theatre of Ghana is testament to the incredible advances that are being made in the efficiency and beauty of LED illumination. The National Theatre of Ghana opened in 1992 and is a hub of culture and heritage, as well as a source of national pride for the city of Accra. The elegant and imposing National Theatre has a complicated construction molding and novel exterior features. When looked at from a distance, the whole structure looks like a gigantic ship or a seagull spreading its wings. The lighting project in Ghana,according to the statement, is part of Philips’ annual pan-African Cape Town to Cairo roadshow that kicked off on 11th May 2015, in Cape Town. Ghana is the sixth stop on a journey covering 12,000 km across 11 cities and 8 countries over a period of 4.5 months.